Dimensions: 16.5" X 10" X 6.5"
Capacity: 18L / 1100 cu. in. The Crux is the largest backpack in the collection with 1 large compartment and a top zippered pocket. 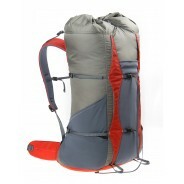 It has an 18L capacity and is made fully of 500D Nylon Cordura fabric with daisy chain loops for external attachment.